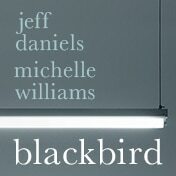 Just a reminder to consider purchasing tickets for two outstanding actors back on Broadway, Jeff Daniels and Michelle Williams as they recently began preview performances in a Joe Mantello (Wicked) play called Blackbird at New York City's Belasco Theatre. The show is playing a limited engagement thru June 11, 2016 and opening night is March 10, 2016. Blackbird has won an Olivier Award for its London production in 2006 for Best New Play. It played Off Broadway in 2007 with Jeff Daniels in the lead along and Allison Pill as well. Blackbird is about the past relationship between Ray and Una who after 15 years find each other again. Ray is now middle-aged and Una is now 27 years old. They last saw each other when Ray was arrested following their illegal sexual affair and even though Ray has tried to create a new identity for himself, Una locates him and confronts him at his place of work. I'm a big fan of both Michelle Williams and Jeff Daniels (who isn't right?) If you think you'd like to see these two amazing actors in an exciting drama, you might want to consider a call to my company Applause-Tickets.com. We have specially priced Blackbird tickets while the show is in previews. We hope to hear from you soon if your plans include Blackbird tickets or possibly one of over 30 shows playing in New York City this Spring season of 2016. Bye for now, see you soon at a Broadway theater in New York City in the near future.